As you might guess, Betrayal: Legacy is a new take on Betrayal at House on the Hill, a 2004 title that Daviau contributed to when he worked full-time for Hasbro. Avalon Hill released a second edition of that game in 2010, with an expansion for it — Widow’s Walk — appearing in 2016 and a Dungeons & Dragons-themed standalone version — Betrayal at Baldur’s Gate — being released in 2017. 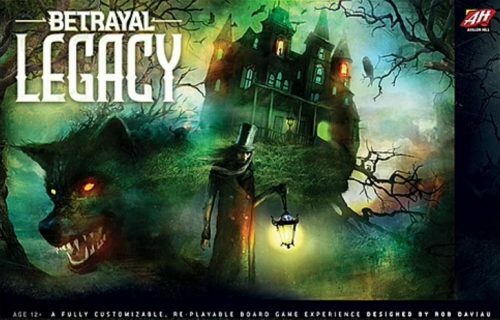 Betrayal Legacy marries the concept of that first game — exploring a haunted mansion — with the permanency and multi-game storytelling exhibited by Daviau’s Risk Legacy and other legacy games that followed. Betrayal Legacy, which will be released in Q4 0218 [sic], consists of a prologue and a thirteen-chapter story that takes place over decades. Players represent families, with specific members of a family participating in one story, then perhaps an older version of those characters (assuming they lived) or their descendants showing up in later stories. As with other Betrayal titles, the game is narratively-driven, with elements that record the history of your specific games. The tools mentioned earlier, for example, become attached to specific families. This isn’t just a bucket; it’s my bucket, the Martin bucket, the one my grandpappy used to feed his family’s pigs when he was a boy, and while you can certainly use that bucket, I know how to wield it best from the time he spent teaching me how to slop. Yes, it’s an heirloom bucket, and when kept in the family, I get a bonus for using it. Daviau served as lead designer on Betrayal Legacy, with others contributing elements, designing haunts, and developing the material. He says that while Betrayal at House on the Hill played with a lot of horror movie tropes, Betrayal Legacy is built more around horror stories, with players creating their own story over the course of the game as they encounter roughly one-third of the fifty haunts included. Once you close the final chapter, you’ll have your own unique version of Betrayal Legacy that can be played again. We’re SUPER excited about this announcement and to see how this game will work! Look for it in the store at the end of next year.